So, we rented for one year a cute three bedroom apartment, for $286 per month. As opposed to the first landlord, Sonya, who showed me her apartment a second time and claimed $500 was only for the upstairs, these new landlords seem really honest. They pointed to us the downs too. For example, the shower does not have hot water after 9PM. (But this is actually for the whole town due to the water pressure – we are very high in the mountains). They also sold us a stove and explained to us that the only problem they had with it is that the flames are not too high. It surely doesn´t bother me at all, if anything it might discourage me from frying foods. (I won´t be the one to cook anyways since I have help around the clock. Leonore in the morning and her daughter Julia in the afternoons. More about that later). So, back to the house. My new landlord took me all the way upstairs of this 3 family- house (she is my upstairs neighbor) to show me the “laundry spot”… And here I discovered the most amazing, beautiful, breathtaking vue of the beautiful mountains and peaceful scenery. 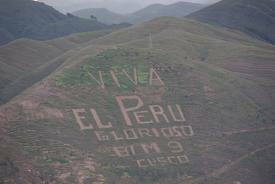 With the famous writing on the mountain¨Viva El Peru¨!! This, my laundry spot???? I don´t think so! But I surely can imagine sitting there meditating, reading or just reconnecting with the world. So now that we have the house we need…furniture!! 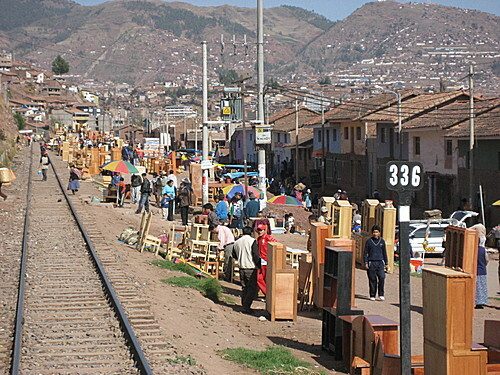 We went to an open market which opens on Sundays, called Wanchaq. Artisans from all around campos (villages) bring their work of art. Beds, bookcases, tables etc..All is wood work. Some finished and colored wood, some just plain wood. We took a cab from the hostal we are staying at and accompanied by 3 of our children and our dear helper Leonor (for bargaining purposes), we got to this market. 5 wooden bed frames 350 soles : $128 (yes, for all five!!) Leonore managed to bring the price 100 soles down! And all these are hand made, by local carpenters! Now, how did we bring all these to our new house? Leonore just asked the person who sold the bed frames if they could help with transportation. It got quickly arranged by a small truck fro the price of $14!!! (It is about half an hour ride). While I took a cab and went back to the hostel with the kids. Our only regret: we didn’t get to buy vegetables and fruits in this awesome market!! By the way, Leonore told me that Sonya has an attractive offer for me: rent me her upstairs and downstairs for $2,000 for three months. Now, the furniture are all in the new house. What is missing? Mattresses and a bunk bed. (This is the reason why I only got 5 bed frames instead of seven). Back in the hostel, I ask Clever (the 25 years old hostel proprietor -more about him later) about the rumor I heard that he has mattresses for sale. Yes! He does! and what else does he have to sell? A bunk bed!!! He is selling all these goodies for $320, AND, he will bring them in the morning directly to our apartment. Now, let me ask you: Does is ever get better than that?? Sharing a Shabbat table with 150 people! Such a small world! 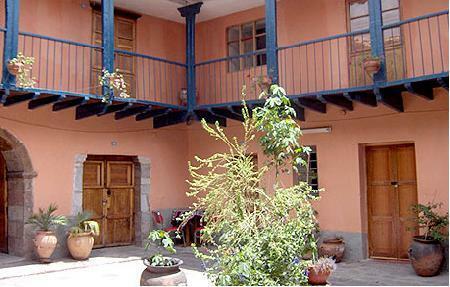 Right here in Peru, within 150 people, I met a person who grew up in the same house we lived in Israel for three years!! They were the previous tenants…such a small small world!!! 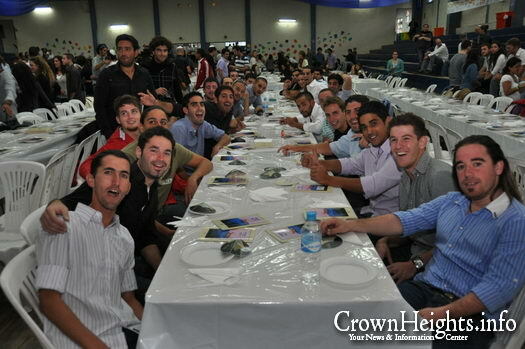 The Shabbat table was about 150 Israelis, some dressed formal, some less, all sharing zmirot and songs. All looked very happy and very hungry. It felt like we were all united to spend this Shabbat together. We spoke with some and they were quiet puzzled by us being there, specifically when we explained that we are here to live! The Rav made some announcements which included warnings for the various sport activities this place is so popular for. He then went table to table to greet all guests and when he came to us, I told him that he really scared me with the warnings.. He asked jokingly if I was planning in taking parts in some of these activities and I said : No, but now I really have to pray hard for the welfare of all!! We went back to Bet Chabad for breakfast (Jachnun) at 9:30, followed by Tefilah (prayers) from 10 to 12 and then lunch with about 90 people, another tefilah and went home. Julia, our babysitter came at 3pm. At 5pm, we went to a Shiur of Kabbalah, that was full of insights. It was the purpose of men in the world and how we are God´s partners in making the world a godly place. It has been a truly delightful and restful Shabbat. 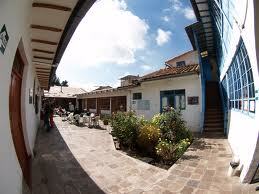 We are staying in a hostel (pronounce hostal) for a few days until we find a rental. Yesterday we found a rental – not too good, not too bad. The lady came to show it to me with her husband and asked for $500, for a 4 bedroom duplex. In the afternoon she shows it to us again and, surprise surprise, she now says that it is $500 for the upstairs only. Not only this is a clear manipulation but she claims that it is what she said this morning too. But even more funny is that there is no separation between the two units. So I told her thank you but no thank you and good bye. Today I found a lovely 3 bedrooms. closer to the center for $280. The landlords are very honest and live upstairs! They even have a stove to sell us for $30. 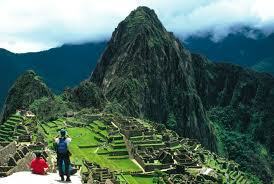 Peru has something to offer we could never find in the US. Something that makes all other activities possible. Something that is more precious than anything else. It is a four letter word: TIME! Time to finally do what we could never do before for lack of time. Time to speak to one another, to go for a walk, time to get to know our children better. We have been married for 25 years and gave birth to 11 children ranging from 24 to 4 years old. Two of our daughters are already married, one is a mother to a beautiful baby girl, the other is expecting a baby in December. We have lived in several different countries over the course of our lives, starting before we were married. My American born husband was raised in a military family who lived in Japan, Germany and the UK (the UK – before he was born) as well as various states of the US. Me – born in France and moved to Israel at the age of 16, where met my husband at the age of 19. We both lived in Israel, the US, Israel again, TWICE. Each time for different reasons: schooling, business, or a combination of both. (I don´t want to bore my readers). We have the possibility many don´t have: we operate an online business that requires limited presence in the US. So we are very lucky to be able to move from one country to another. All we need is to get organized and save some $$$ and take a plane – or two – or three. We spent a year in South America two years ago and just , well, loved it! The only reasons we came back was personal familial reasons. 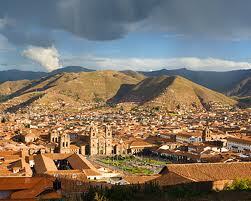 So we just spent a year in the US, after spending a year in Peru and Paraguay and the contrast was chocking. For me this year was a combination of frenzy, frustration, running after my tail, and an overwhelming sense of being put into the spin cycle of my washing machine. I surprised myself with the vehemence and conviction of my voice as I was announcing to my mother our decision of returning to live in South America. I REFUSE TO CONTINUE TO LIVE LIKE THIS!!! No time for myself or my children, running around all day long, being exhausted day in day out, and most poignantly: not knowing my own children. Yes! On an average day we speak to our children maybe 10 minutes and it is all superficial talking about homework or cleaning their room, or discipline. I feel the frustration of being here physically but completely in another universe mentally, emotionally and spiritually. The errands, shopping, driving, phone calls, crisis and interruptions are all taking over my life and pushing me away from what I really want: a simple life with my husband and children. I am not asking for luxuries,fancy outings, and polished looks. All I want is time with my children, in order to connect with them and know who they are. I also want them to know that I am here for them and love them more than anyone else (besides their father -of course). I resent the distractions and the frenzy who transport me to another reality. I am tired of feeling so frustrated. So it all brings us to our decision to move back to South Amerca, homeschooling and a healthy diet of fresh vegetables, fruits, chicken and eggs. Fresh breads and cakes. And all the naturally good stuff.